Vietnamese Prime Minister Nguyen Tan Dung received US Secretary of State Hillary Clinton, who is on a Vietnam visit to attend ASEAN meetings, in Hanoi on July 22. The Government leader welcomed Hillary Clinton’s visit on the occasion of the 15th anniversary of the two countries’ diplomatic ties and highly valued the results of her talks with Deputy Prime Minister and Foreign Minister Pham Gia Khiem, which discussed ways to boost bilateral relations, in both width and depth, in the fields of economics, trade, investment, education and training, and responses to climate change and rising sea levels. PM Dung spoke highly of the US Secretary of State’s visit to attend the ASEAN Regional Forum, saying he believed that the contributions of the US and ASEAN countries’ efforts will help ensure regional security. 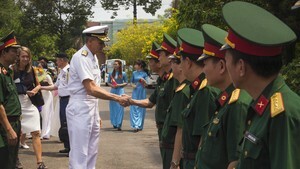 He also expressed thanks for the US government’s support for Vietnam in HIV/AIDS prevention. 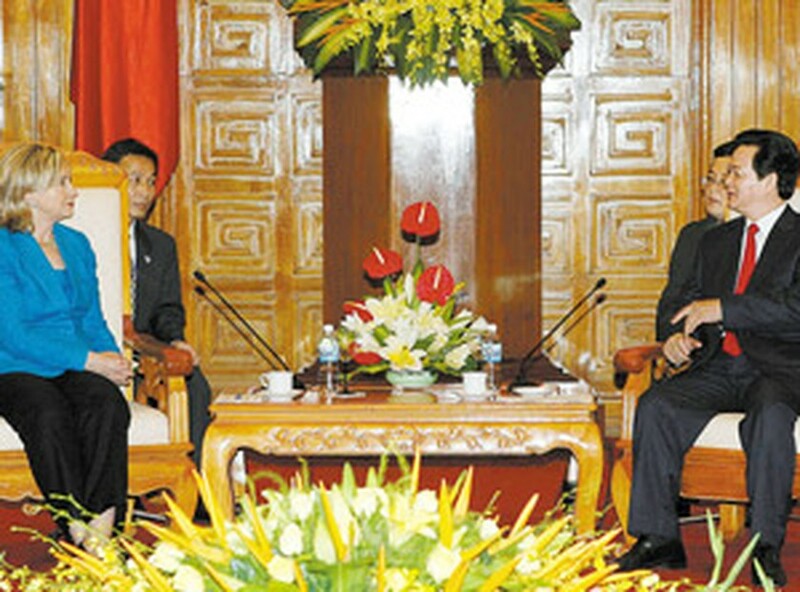 The PM then suggested the US not impose trade barriers such as anti-dumping and anti-subsidy taxes on Vietnamese goods, assist AO/dioxin victims and help the country deal with climate change. For her part, Hillary Clinton affirmed that President Obama had committed to raising the US-Vietnam relationship to a higher level of cooperation and dialogue with the focus on cooperation in economics, trade, investment, health, and climate change response. She added that in late October this year, she will arrive in Hanoi to attend the East Asia Summit (EAS) and prepare for President Obama’s Vietnam visit in 2011. Regarding the East Sea issue, the US Secretary of State said that countries should work together to ensure peace and maritime security under the international law. She expressed the support of the US for regional countries seeking a long-term solution for this issue, firstly abiding by the Joint Declaration on the Conduct of Parties in the East Sea (DOC). At the reception, both host and guest agreed that the two sides should strive together to elevate their relationship to a new level of development in the spirit of equality, mutual respect and mutual benefit. All problems should be addressed through cooperation and dialogue.